California is known for its beautiful beaches and Sunset Beach is no exception. With over 9.3 miles of soft, sandy beaches and approximately 76 parks, Sunset Beach provides endless opportunities to showcase your brand with airplane advertising. This advertising goldmine attracts over 15 million visitors per year, and you don’t want to miss out on targeting this beacon of consumer activity. Van Wagner Aerial Media’s banner planes allow you to target all of the surfers, joggers, bicyclists and tourists who come to Sunset Beach each year. You can also choose from our other sky advertising capabilities including: sky writing, hot air balloons, helicopter banners, and blimps. Sunset Beach is host to a wide array of events that are perfect for an aerial media campaign. Sporting events like the US Open of Surfing or the AVP Pro Beach Volleyball Tournament are perfect settings to capture thousands of impressions, ensuring that these avid fans remember your brand while they are having the time of their lives. Whether it is the historic Sunset Beach Art Festival, Oktoberfest or the fantastic July Fourth Parade and Fireworks celebration, you will find countless opportunities to position your brand front and center for a large, captive audience. 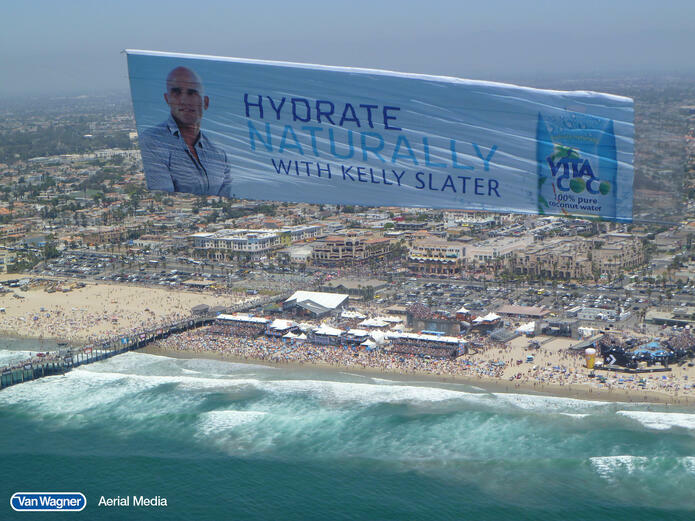 Since many of Sunset Beach’s main attractions are outdoors, aerial advertisements are an optimal way to get your brand noticed. Let Van Wagner Aerial Media help your brand get the attention it deserves. We make the largest plane banners in the industry and are vastly considered premier industry experts in the world of aerial advertising. If you have questions about the cost of a banner towing plane, blimp, or sky writing campaign in Sunset Beach, or any other inquiries, please don’t hesitate to contact us today. Just click below for your free aerial advertising quote!